As a Minnesotan, I have an affinity for talking weather with people. It is a time honored tradition in our regional dialogue. Minnesotans are borderline obsessive about watching and talking about how incredibly hot, cold, rainy, snowy or sunny it is outside. Maybe it is because we have such surprising extremes - we have a common saying that "if you don't like the weather, just wait fifteen minutes". Or more likely, midwesterners are just an odd group of people. One thing that comes up consistently when speaking with people about the weather is how wrong the weather person was for that day. It isn’t uncommon for someone to bring up how the weather person “said it was going to storm all day and it turned out beautiful” or how someone “went up to the cabin because the weather report said sun the whole weekend and got poured on”. It becomes a game - The common folk vs. The weathermen/weatherwomen. My boss was saying that when he owned his irrigation business, that he was constantly at odds with the weather report. He’d hear the weather report and try to plan his week out based on whether or not it was going to rain. Much of the time, even if it was supposed to(they’re always wrong) rain, he was able to get work in. He had a few tips that he'd use to get around any weather report. The problem with meteorologist predictions aren’t that they’re necessarily wrong, they’re normally just very broad in their predictions. For example, in the Twin Cities in Minnesota, the geographic area that the weather report covers spans quite a few square miles on the map. If you watch the radar on days that it is supposed to rain, you might see that the rain might miss the area you’re planning on working in altogether. Watching live radar can often yield better results than just taking a look at the overall weather forecast. All of your customers will want to have their yard taken care of right away, or their irrigation system installed immediately, or whatever service you provide. While each one of your customers is just as important as the last, prioritize your work when you know that there is a possibility of rain. If you know you’ll need to be digging up someone’s yard for the following day or two, make it a priority to get that work done before any weather moves into the area. Prioritize your routes effectively so that when rain or storms do hit, you aren’t scrambling the day after it stops raining. 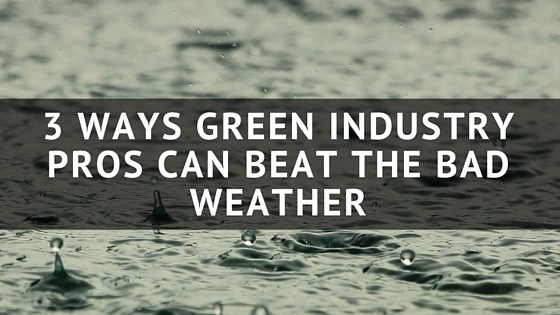 Want to see what other green industry professionals are doing to avoid other obstacles in their business? Download the 2016 Green Industry Benchmark Report today!